In a saucepan cook onions, garlic, and butter until onions are tender but not brown. Add flour, salt & pepper, and milk. Cook on a medium heat until boiling and sauce starts to get thick. Peel and thinly slice potatoes. Grease 1 1/2 q casserole dish. 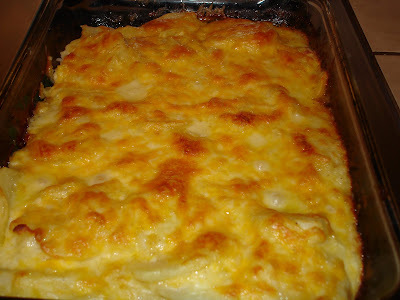 When sauce is done, mix in potatoes and 1 1/2 cups cheese. Put in greased pan and cook at 375 for 45 minutes. Then take out and stir and put remaining cheese on top. Cook for another 30 minutes or until potatoes are tender. I adapted this recipe from one that I found in my old Better Homes and Gardens cookbook. Its a really easy, yummy sidedish that I serve with a lot of things.